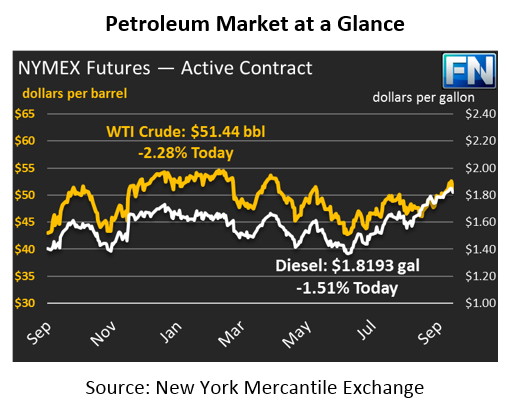 As we end the week, news to drive oil markets has been light, and oil prices were generally flat yesterday. Crude oil is at $51.44 this morning, just 12 cents down from yesterday’s close of $51.56. Oil prices had a large $1.64 price range yesterday, reaching highs of $52.86 and lows of $51.22 before settling in the mid-$51 range. Prices today have been more stable so far, trading in a narrow fifty-cent band. Diesel prices are down by over a penny this morning, sliding to $1.8193 after a week of strong trading. Yesterday saw prices briefly jump higher during the day before ending the day flat. Diesel prices have been trending downwards since their high point on Tuesday. Gasoline is also roughly a cent down, trading at $1.6225 currently. Gasoline also saw prices trade flat yesterday, losing just forty points from open to close. The situation in Iraq keeps getting messier. Recall that earlier this week, the Kurds in some northern Iraqi districts voted over 90% in agreement with independence from Iraq. Turkey, which has a large Kurdish population, has come out strongly against the measure. Yesterday, Turkey indicated they would deal only with the main Iraqi government over Kurdish oil flows, meaning that 500-600 kbpd of Kurdish production could be taken off the market overnight, though so far the Turkey-controlled pipeline remains open, connecting Kurdistan and Kirkuk oil to the Mediterranean.